From The Guardian (Saturday September 30, 2006) by Audrey Gillan. Reg Weston's account of the battle is also in the libcom library. 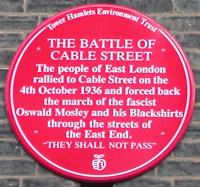 On the 8th October 2006 there is an event on Cable Street to commemorate The Battle, see this page for more details.